The consensus is a followup document to the ASEAN Declaration on the Protection and Promotion of the Rights of Migrant Workers adopted in January 2007 in Cebu. MANILA, Philippines – After a decade, the Association of Southeast Asian Nations (ASEAN) has finally made progress in ensuring the protection of migrant workers. 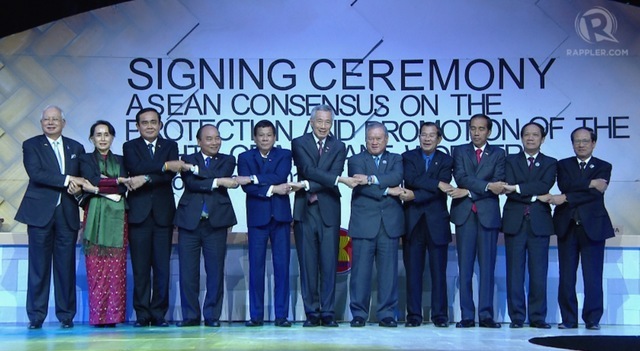 Southeast Asian leaders closed their 31st ASEAN Summit, which coincides with the golden anniversary of the community, by signing the “ASEAN Consensus on the Protection and Promotion of the Rights of Migrant Workers” on Tuesday, November 14. President Rodrigo Duterte, representing the Philippines as ASEAN chair, presented the signed document to ASEAN Secretary-General Le Luong Minh. This consensus is a followup document to the “ASEAN Declaration on the Protection and Promotion of the Rights of Migrant Workers” adopted in January 2007 in Cebu. It also serves as a commitment by ASEAN member-states to formulate a plan of action to implement the rights specified. This plan will be made during next year’s meetings under the chairmanship of Singapore. The creation of the consensus took more than 10 years because parties could not agree on the legal nature of the document, the protection of undocumented workers and the coverage of migrant workers’ families. Philippines and Indonesia, both source countries, wanted a legally-binding framework. Singapore and Malaysia only wanted the document to be a guide to avoid the increase in the number of undocumented migrants. Both countries are migration hubs for workers. Department of Labor and Employment Secretary Silvestre Bello III earlier said they opted not to spell out whether or not the document is legally-binding since signatories are already aware of their commitments. Despite being a landmark gain, the consensus was still silent on the issue of undocumented workers. There are around 10 million migrant workers in the region, many of whom are staying in foreign countries without proper papers. Philippine statistics, meanwhile, show that there are around 212,435 overseas Filipino workers (OFW) in Southeast Asia. Left-leaning OFW group Migrante said these OFWs are those whose work permits were not renewed or who were forced to leave their employers due to abuse and exploitation. Migrante also urged ASEAN to create a body that will oversee violations and concerns of the migrant workers, whether as a consultative body or a tribunal. “Because there is a lack of support mechanisms in both sending and receiving countries, the tendency is always to deport or repatriate victims of abuse and exploitation resulting in the denial of justice and non-persecution of perpetrators,” said the labor organization. Migration is growing at a faster rate in Asean than within any other region globally, according to one of the bank’s cartoon-filled reports released Monday entitled Migrating to Opportunity. Between 1995 and 2015, 6.5 million migrants workers in the Asean bloc left their homeland to find better opportunities in neighbouring countries, the report showed. People from Myanmar, Lao and Cambodia were most likely to head to Thailand while Malaysians and Indonesians tended to venture to Singapore, it said. Their total remittances in 2015 stood at US$62 billion, accounting for 3% of the value of GDP in Cambodia, 5% in Myanmar or 10% in the Philippines. Yet the World Bank report states the region could have reaped more benefits if hurdles had been cleared including the high cost of labor mobility, restrictions on workers, and welfare-related problems. “With the right policy choices, sending countries can reap the economic benefits of out-immigration while protecting their citizens who choose to migrate for work,” said Sudhir Shetty, the World Bank’s chief economist for the East Asia and Pacific Region. “In receiving countries, foreign workers can fill labour shortages and promote sustainable economic growth if migration policies are aligned with their economic needs,” he added. Critics say restrictions lead to costly and lengthy recruitment processes. “We are talking about more than 10 steps for migrant workers to deal with. We are talking about redundancies of agencies and processes,” said Mauro Testaverde, a World Bank economist and lead author of the report. “No matter where workers wish to migrate to in Asean, they will face mobility costs several times the annual wage,” he said. “Improvements in the migration process can ease these costs for prospective migrants and help countries respond better to their labour market needs,” he added. By reducing the cost of mobility, the report found, welfare could rise 14% for highly skilled workers and 29% overall. The report suggested some policy changes including more oversight of recruitment agencies and a streamlining of registration processes. Countries can also learn from one another, for example taking a cue from the Philippines, which has good social support and network systems that help migrant Philippine workers adjust and get better protection when working overseas. The bilateral agreement between Malaysia and Bangladesh to reduce the cost of mobility is another good example of how illegal migration can be curbed because migrant workers from these countries have no need to use illegal job recruitment agents. Singapore could do more to enhance welfare and help migrant workers assimilate, it said, adding Thailand should formalise undocumented workers and make the entry process cheaper. Thailand should also improve welfare and protection for migrant workers, the report said. It also urged governments to change their attitude toward migrant workers. Mr Shetty said such restrictive policies result from fears that migrant workers steal jobs from locals. 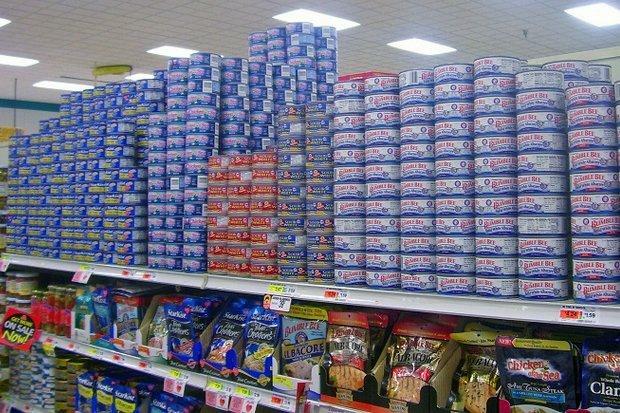 In contrast, the report said Thailand’s GDP would drop 0.75% without them. It has been recently announced that the first batch of domestic workers from Cambodia will arrive in Hong Kong in the autumn. There are concerns about these workers’ vulnerability to rights violation as new comers. Speakers from Hong Kong University of Science and Technology, Employers’ Association and NGOs including a representative of the Mekong Migration Network (Reiko Harima, Regional Coordinator) discuss the issues surrounding foreign domestic workers in Hong Kong in this an-hour-long radio program.